Washington Gas partners with the District of Columbia Sustainable Energy Utility (DCSEU) to help D.C. businesses save energy and money through energy efficiency programs and rebates. The DCSEU provides rebates to business owners for the installation of energy-efficient appliances. Washington Gas is now offering commercial rebates to Maryland customers for eligible water heaters, boilers, ovens and more. Check all requirements for your rebate. Your rebate form will list exactly what you need to purchase and have installed to be eligible for a rebate. Be sure to check for the exact equipment, make, model and serial number before you make your purchase. Also, appliances must be purchased and installed by a licensed contractor. Rebate programs have a specific time period for when you can purchase and submit your rebate application form and proof of purchase. Complete the information requested on your rebate form. Don’t leave anything blank as all information requested is required to verify your purchase. Print clearly, preferably with black or blue ink, and be sure to sign the application form. Mail your completed rebate forms and all required information, to the address provided on the form. Rebates are processed within six to eight weeks of receipt of a complete rebate application form along with all materials necessary to qualify. If it has been 12 weeks since you mailed your submission and you have not yet received your rebate, please call 877-240-9183. Note: At times, rebate applications are randomly selected for procedure audit. Such audits may extend the payment time referenced above by three to six weeks. NUCA is pleased to announce the settlement of a class action lawsuit challenging AT&T’s bills for repairing damage from cable cuts. Please click on the link below for important details. Further information is available at www.attrepairclaimlitigation.com. You may also contact our lawyers, Ken Canfield and David Hagy. 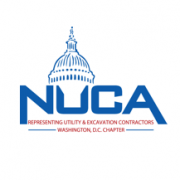 On behalf of NUCA’s national organization and our 26 state and local chapters, including NUCA of DC, we are proud to advocate for our industry and serve as your association of choice. Insurance Associates Celebrates 60 Years in the Business! Insurance Associates is proud to celebrate their 60th Anniversary in June of this year. As the agency reflects on this significant milestone we look at the legacy of our founder, Ted Barker. Ted bought a small insurance agency in Washington, DC in 1956. He aptly named it Insurance Associates, as he wanted all employees to feel valuable to the organization. Ted’s vision was to build the agency based on loyalty to employees, clients, and insurance carriers. Over time the agency grew and IA expanded the client base to include contractors of all types, real estate firms, government contractors and non-profits. Ted’s vision that was instilled within the agency in 1956 is still with us today as we now number 58 outstanding “Associates” in our four offices serving the entire Washington-Baltimore region. “Our success is a result of many factors: our loyal client base, the many associates who deliver exceptional service and our outstanding group of insurance company partners and business colleagues who have supported us over the years. I firmly believe that Ted would be pleased of what we have achieved as we still operate the agency with the values of unparalleled service, integrity, and professionalism that he valued when he started the agency,” said Stephen A. Spencer, President of IA. Insurance Associates realizes that they cannot lose sight of the responsibility to the community that has supported the business over the years, so to recognize this important milestone IA is donating $5,000 to six different charities that have a special meaning to the agency for a total donation of $30,000. Founded in 1956, Insurance Associates is an independent insurance agency serving the Mid-Atlantic region with offices in Rockville, Fairfax, Laurel, and Towson. We are a locally owned company that prides itself on having one of the most competent, experienced, and longest tenured workforces of any agency in the area. We advocate for our clients across a diverse range of products and services including Surety Bonding, Commercial Insurance, Employee Benefit Plans, Personal Insurance and Life Insurance. For more information about our passion and the rest of our team at Insurance Associates, please visit at www.insassoc.com, follow on LinkedIn and like on Facebook. https://www.nucaofdc.org/wp-content/uploads/2016/03/nuca-featured-image.png 217 217 Debora https://www.nucaofdc.org/wp-content/uploads/2017/12/nuca-logo-with-dome.png Debora2016-09-19 16:48:592016-09-19 14:31:24Insurance Associates Celebrates 60 Years in the Business!